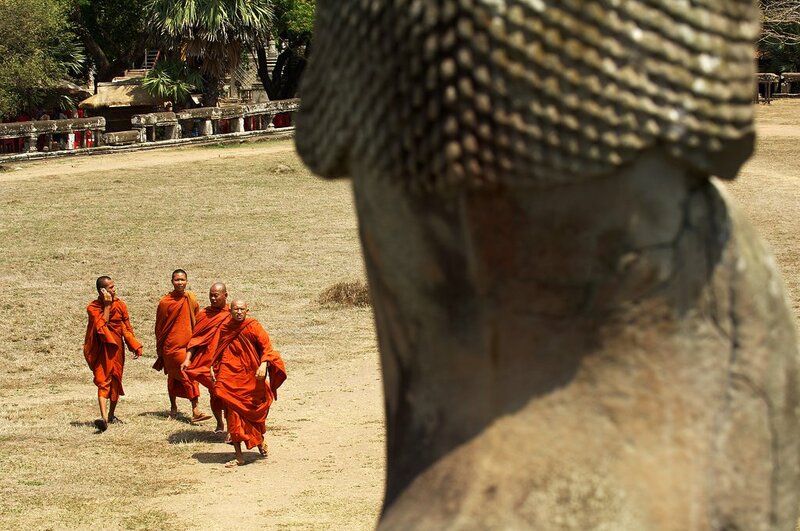 Cambodia is a land with centuries of heritage and a typical tourist itinerary will not do it justice. This biking tour will immerse you directly into the landscapes of the countryside, beyond the reaches of conventional vehicles. Besides visiting the famous sites, you'll pass through the rural midpoints of the journey, where villagers lead traditional lives. 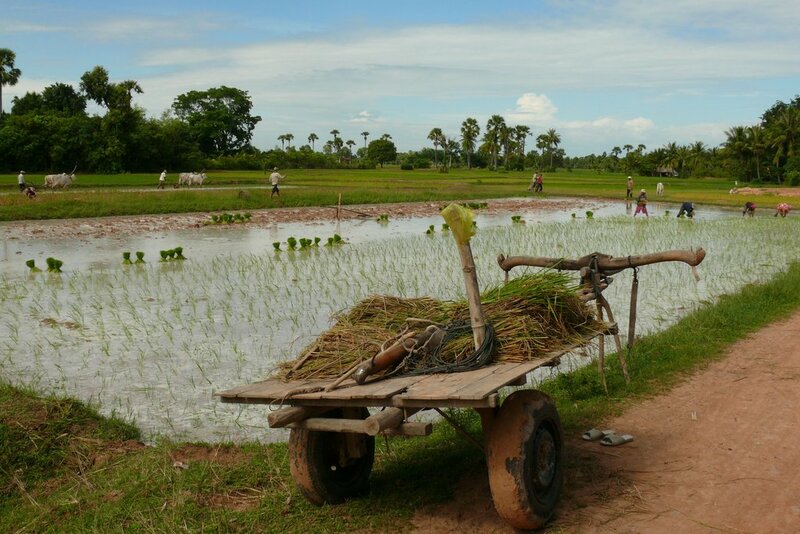 By understanding their cultures and customs, you will be able to uncover the true Cambodia. Along the way, you will get a chance to experience the natural splendor of the region, away from the urban bustle. Welcome to Cambodia! Upon your arrival, meet your English-speaking guide and transfer to your hotel. 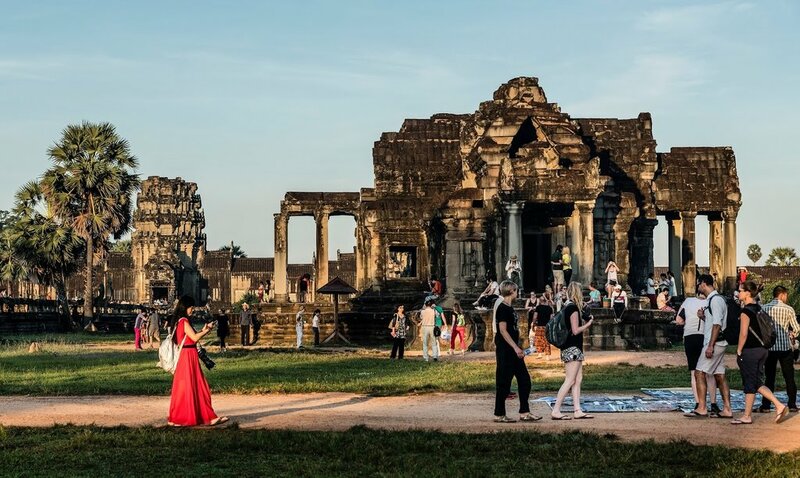 The rest of the day is free for you to get acquainted with Siem Reap. The next day, wake up around 7 am and drive to the gates of Angkor Thom, an ancient royal city featured in the film Tomb Raider. Prepare for a day of biking (3-4 hours), and start traveling along the complex's stone walls. Discover Bayon, a splendid temple decorated with 216 carved faces. Continue towards the temple mountain of Baphoun, then on to the Terrace of the Elephants, before stopping at Wat Tep Phranom. 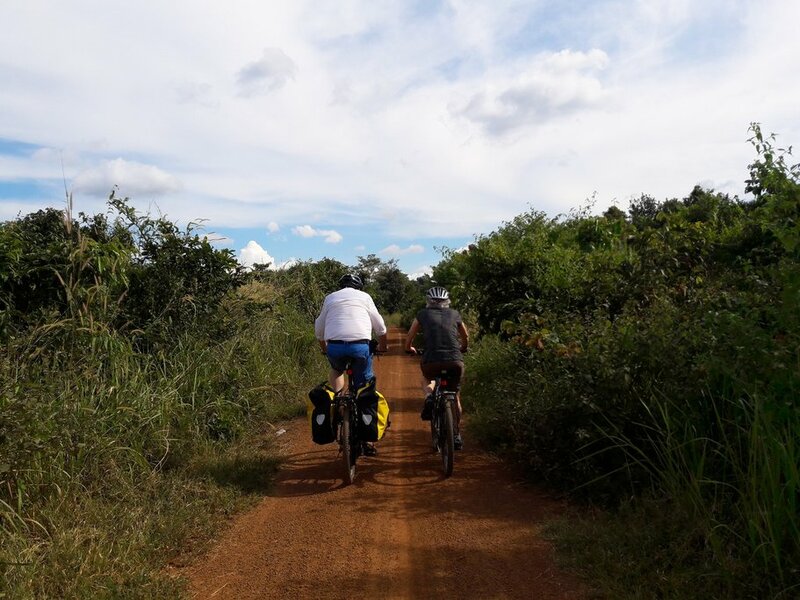 After lunch, bike into the surrounding forest and see the temples of Preah Khan, Ta Nei, and Ta Phrom, entangled among the vines and trees of the jungle. After a long day, return to Siem Reap by car. Enjoy a dinner show and witness Aspara, a classical Khmer dance. Finally, retreat to your hotel for the night. Upon sunrise, we depart for another day, riding mountain bikes through rice fields and villages. Following clay and dirt tracks, we travel along the Old Royal Route to the hidden temple of Chao Srei Vibol, lost within the forest. Along the way, get a glimpse at the serenity of provincial life, far from the urban commotion. The journey is around 30 km. and we will be accompanied by another vehicle. In the afternoon, we arrive at a small village to a warm welcome by our smiling hosts. Then, experience daily rural life and get a chance to explore the livelihoods of regional blacksmiths, hairdressers, palm sugar farmers, and more. Enter a Khmer home, and help hang up mosquito nets. As the afternoon comes to an end, go for a walk around the village and watch the sun set behind the nearby lake and rice paddies. Return and watch as our hostess demonstrates how to cook dinner in the traditional way, before enjoying the delicious meal. Spend the night at a homestay in the village. Today, prepare for a more rigorous adventure. 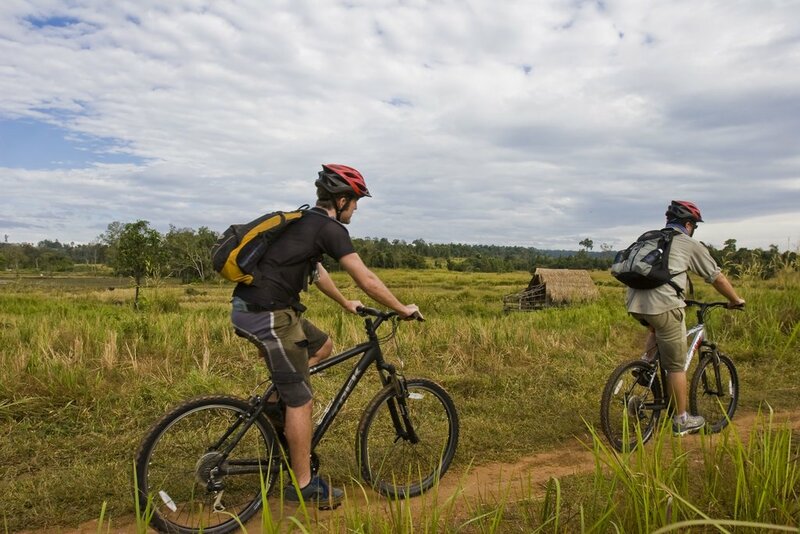 Get dropped off at the foot of the Phnom Kulen mountains, then begin your 140 km bike trip uphill. Continue up a sacred mountain, where a waterfall perches amongst the highlands. Eat lunch at a secluded restaurant, then go for a dip in the waterfall pool if you wish. Continue trekking towards the summit, cross the Halo Bridge, and pass the ruins of Prasat o Pa'ong and Poeng Tbal. Finally, after the challenging 4-5 hour ascent, take a break and spend the night in a stilt house in the mountains. After breakfast, say goodbye to our hosts and bike to another mountain village. There, meet the local artisans and learn the techniques of their trade. Help farmers tend the fields and gardens. Witness the lifestyle of a family of fish farmers. Through understanding the variety of ways locals make a living, we will be able to see how the roles of different villagers come together as a whole. For lunch, we will have a picnic in another nearby village. Afterward, we will visit a school there and interact with the children, unless classes are off for the weekend or holidays. Later in the afternoon, we return to back to our host village, completing the day's total 2-3 hours of biking. Help cook dinner or stroll the village paths. Tonight will be your second night in the homestay. After thanking our hosts for their hospitality, we continue our journey along the countryside. 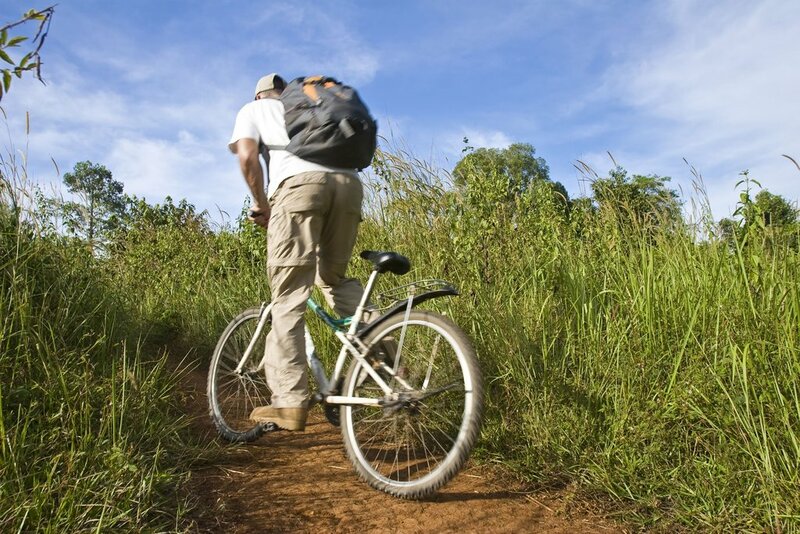 We will bike for 4 hours through green fields, limestone meadows, and dense jungles. Deep within the jungle, we will discover Srah Dumrei, a collection of animal statue ruins. Then, we will stop for lunch near some scenic waterfalls. In the afternoon, we will meet our driver and take a vehicle to reach Koh Ker, a temple city complex remotely located in the northern jungles. Appreciate the charming temples and shrines, as well as the impressive center pyramid. Watch the sunset atop Prasat Thom, a stunning double-temple. Tonight, we will stay in a basic guest house cooled by fans. Today, we will focus on progressing through 40 to 50 km of rough terrain. Bike through the forest, reach a trail bringing us back to civilization, then pass the rice fields to head back into the wilderness. Two hours later, we will emerge at a riverside village, where we will take a break. 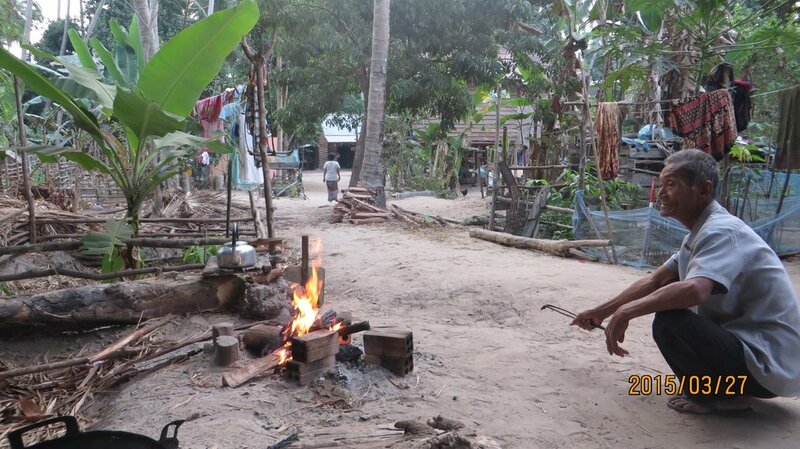 Continue on until nightfall, where we will approach another village and spend the night at a homestay. After miles of biking, we finally return to the temple region. We will visit the Great Preah Khan, a temple dating back to the 12th century. Fully explore the temple, a hidden gem unknown to most of the public. Feast your eyes on intricate statues of dancers, laterite-stone walls, and ancient terraces. Later, we will continue on the smaller temples of Preah Damrei Mebon, Preah Steung, and Bakan. Finally, we will board a vehicle to the small city of Kampong Thom and spend the night at a hotel. Cherish your last day away from the city. Bike 1-2 hours to the temple of Sambor Prei Kuk, then drive to Kampong Kleang, a village on the shores of lake Tonle Sap, the "Great Lake". Southeast Asia's largest freshwater lake, Tonle Sap is a vital ecosystem that sustains Cambodia's agriculture and fluctuates between 4 to 8 meters deep depending on the season. From August to January, the lake covers a large swath of surrounding lands. Board a small boat and tour the peaceful communities that thrive alongside the lake. Then, travel by vehicle back to Siem Reap. 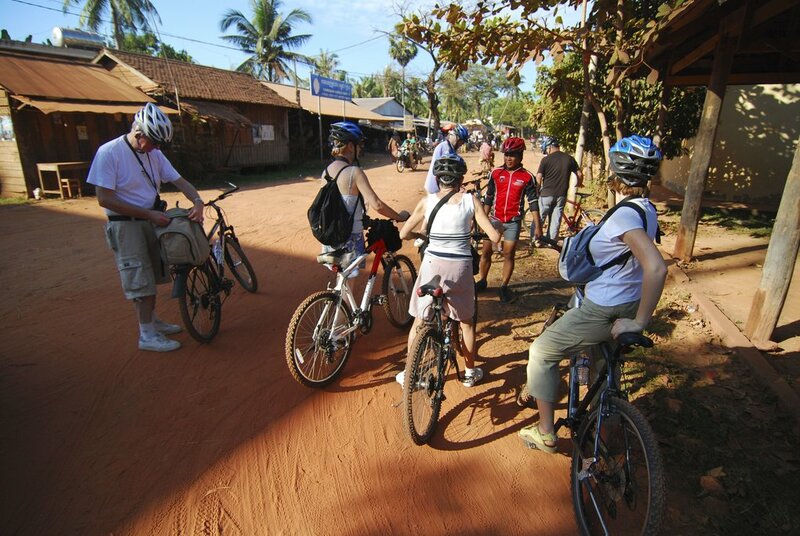 Bike through the urban region home to the most important temples and capitals of Angkor. Today's 3-4 hour trip starts at Angkor Wat, the largest and most famous archaeological site in all of Cambodia. A temple representing the home of the Hindu gods, Angkor Wat contains towers, galleries, and a plethora of other structures intricately decorated with religious carvings. Then, depart to Banteay Samre, one of the farthest, least-known temples, before heading to the stone elephants of East Mebon. Continue on to Pre Rup, and pass through more villages and rice fields. 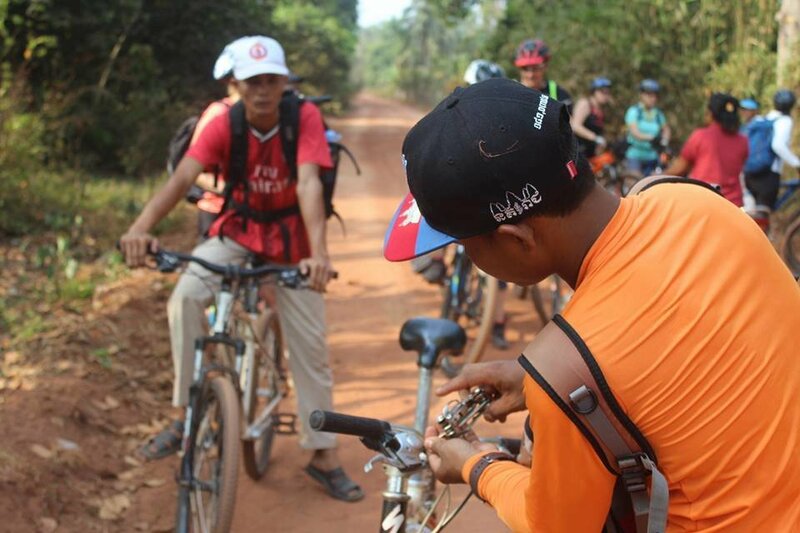 Next, bike on towards Banteay Kdei and Srah Srang, then take a break to eat lunch with a local family. Afterward, bike through surrounding forests to return to Angkor Wat, where we watch the breathtaking sunset. 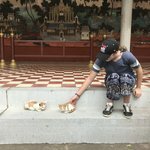 Return to Siem Reap by car, eat dinner in the city, and spend the night at a hotel. Go out for one last excursion, and head to the countryside around the city. Meet a community of stone carvers and visit a national silk farm in Pouk. Then, learn about the details of rice cultivation from a farmer and his family. Continue on to the Western Baray, an enormous reservoir of water that irrigates the surrounding temples. Go for a swim, then eat lunch picnic-style. In the afternoon, play games with local children and shop at the old market. See the beautiful murals of Wat Bo pagoda, and return to town for dinner and a massage at the renown Frangipani Spa. Return to your hotel in Siem Reap for your last night. Your journey in Cambodia has come to an end. Transfer to the airport for your international flight.